The 7,200-square-foot fitness center in the new David A. Tepper Quadrangle is now open for students, faculty and staff. The new area includes 11 treadmills looking out floor-to-ceiling windows on the west side of the building, 13 elliptical machines, three upright bikes, two spin bikes, two recumbent bikes, two rowing machines, a stair climber, an exercise studio, a set of free weights with benches, weight machines, and men's and women's locker rooms. Towel service and locks for daily use lockers can be purchased at the Tepper Fitness Center. Programming in the exercise studio, small group classes and other fitness activities will begin when classes start at the end of August. Fitness center hours are 7 a.m. – 3 p.m., Monday through Friday. Athletic facility hours are subject to change at any time. For the most updated information, please call the Tepper Fitness Desk at 412-268-1996. The Middle States Commission on Higher Education has formally affirmed Carnegie Mellon University’s accreditation through 2026. As part of the reaccreditation, a comprehensive process engaged the university community in rigorous self-study and analysis to highlight areas of strength, and identified specific opportunities for continuous improvement and growth. CMU also hosted visits by peer evaluators, including faculty and administrative leaders from nine other universities. The results of this two-year process demonstrated that CMU meets or exceeds all required standards, which include more than 50 criteria. The recognition from peers in higher education indicates that CMU continues to hold its high standards in carrying out the university's mission effectively and with integrity. The CMU Police Department will conduct an active shooter exercise in the Cohon University Center between 8:30 and 9:30 a.m. on Monday, July 30. The exercise will involve approximately one dozen police and security officers who will be given an evolving active shooter scenario that they will address to bring the event to resolution. The actual drill is a “walk-thru” in which officers will be directed to respond to multiple locations within the Cohon Center. There will be NO weapons or specialized equipment involved in the drill, however, there will be a considerable number of police vehicles in the area, especially around the loading dock. Cohon Center staff have been advised and signage about the drill will be posted in the facility. This will be the CMU Police Department’s seventh active shooter drill on campus this summer. Pittsburgh Police and University of Pittsburgh Police have expressed interest in these drills and will be sending command staff to observe this exercise. Watch the active shooter training video. Based on feedback from a 2018 survey of faculty and staff who smoke, the Healthy U Wellness student survey of 2016, and the recommendations of a faculty, staff and student committee, 13 of the 39 designated outdoor smoking areas on campus will be discontinued, effective Aug. 1. The remaining 26 designated outdoor smoking areas are identified by signage and can be found online. Mushroom Park, west of the Cut. In addition to using the survey results, the committee moved to eliminate smoking areas outside non-residential buildings, near doorways and building entrances, and near health and athletic facilities. The committee also took into account complaints received about specific locations and the proximity of several designated areas. Signs will be posted at the 13 discontinued locations to notify smokers and to provide information about tobacco cessation resources that are available to members of the university community. GuidanceResources, CMU’s employee assistance program, provides free personal counseling and support to help quit smoking and stay tobacco-free. You can contact GuidanceResources at 844-744-1370 for confidential assistance. Highmark, UPMC and Aetna health plans, and the CVS/Caremark prescription program also offer tobacco cessation programs for its members. Contact your health care provider for more information. Carnegie Mellon’s Smoke-Less Campus Policy, approved in August 2017, prohibits smoking in all university buildings and facilities, and limits smoking to designated outdoor areas. Nominations are now being accepted for the Alumni Association’s 2019 Alumni Awards, which recognize CMU graduates for their outstanding contributions to the university and the world. Alumni are honored in the following categories: Founders Medal, Alumni Achievement, Alumni Service, Outstanding Recent Alumni and Faculty & Staff Impact. An online nomination form, list of previous award winners and descriptions of each award category can be found online. The nomination deadline is Sept. 1. Catering will no longer procure or transport alcohol for events. Therefore, if the event does not involve the direct or indirect sale of alcohol, the recommended procedure is to use the vendors Soiree Partners/Dreadnought Wines to purchase and transport the alcohol to the event. If the event involves the direct or indirect sale of alcohol, it must take place on licensed premises (e.g., a restaurant with a liquor license) or the alcohol must be purchased, transported and served by a vendor that has a liquor license and an off-premises catering permit allowing it to sell alcohol. The procedure can be found online. Questions and/or concerns can be directed to social-host@andrew.cmu.edu, the Office of General Counsel (412-268-3747) or to university-contracts@andrew.cmu.edu. 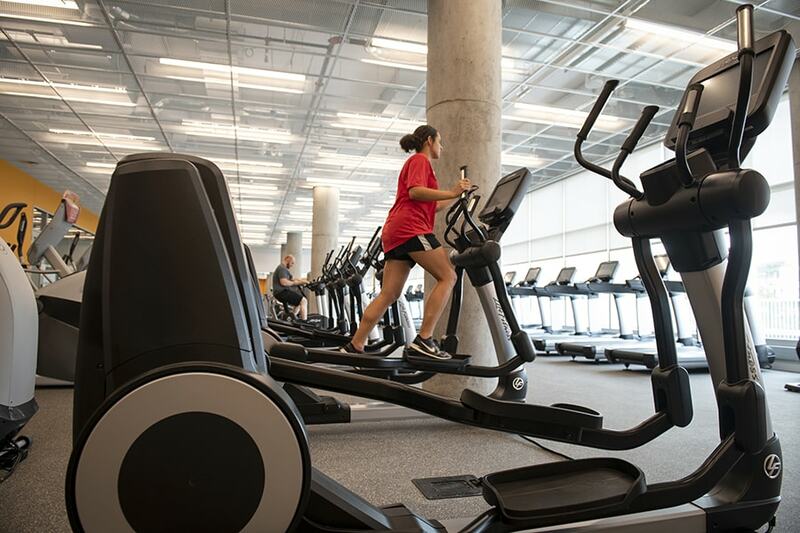 The new fitness center in the Tepper Quad has opened.